Have you chased your newly running toddler in the park today? Had a dance party in the living room? Tossed balls in the yard? If not, go for it, because teaching her how to run, jump and throw (as well as kick, catch, skip and more when she’s older) are directly linked to a lifetime of physical activity and its countless benefits. Gross motor skills during your child’s first 2 years of life can be divided into basic movement skills (like rolling, crawling and walking) and fundamental movement skills (like running, jumping and throwing). Fundamental movement skills (FMS) are the building blocks of physical activity, and studies show that children who master them are more physically active throughout childhood, adolescence and adulthood than their less-skilled peers. 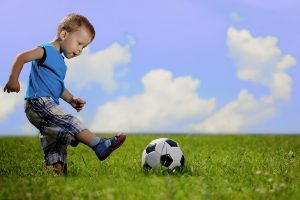 Researchers have discovered that overall, today’s children are less active than children of just one generation before. They have less physical strength, flexibility, and endurance. Pediatric obesity is on the rise, and along with it greater risk of disease. Child development experts blame this phenomenon on various factors, including a decrease in adequate FMS. The most important thing you can do is teach your child these skills. Research shows that FMS need to be taught and practiced, so engage your little one in activities and games that incorporate age-appropriate FMS skills. Our BabySparks program is a great place to find ideas. Be mindful about baby equipment. Child development experts, including the American Academy of Pediatrics (AAP), warn that overuse of baby equipment like swings, bouncy seats and activity centers can interfere with developing the basic movement skills (rolling, crawling, walking, etc.) your little one must master before she can learn FMS. We get it that sometimes you need to, say, take a shower, and a bouncy seat on the bathroom floor is the only safe place to put your baby! The key is using baby equipment for short-term safety reasons rather than habitual convenience. Go screen-free. The AAP recommends no screens at all before 18 months of age, and after that no more than one hour per day. Among other reasons, the AAP warns that screens can interfere with the full-body practice your child needs to master basic and fundamental movement skills. Aim for 60 minutes of movement a day. According to the American Heart Association, your little one should get at least one hour of moderate, enjoyable physical activity every day, starting at age 2. At BabySparks we say why not start earlier? The day you bring your baby home from the hospital you can start doing our gross motor activities with her (hello, tummy time! ), which incorporate daily physical activity from the get go. This will help keep her on-track with her basic movement skills so she’s ready to start learning FMS during her second year. Lastly, remember that nurturing your little one’s FMS skills not only sets her up to reap the fitness and health benefits of physical activity; being active is also linked to improved cognitive, social, and emotional outcomes.